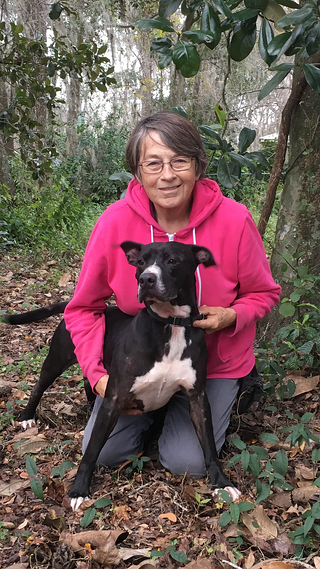 If you saw how many animals Saint Leo alumna Carolyn Allard cares for on her five-acre property in Florida, you’d immediately understand how much she cherishes furry creatures in need. The 69-year-old native of Walhalla, N.D. who now resides in Brooksville, Fla. is the proud owner of We Care For Paws Foundation. The 501(c)3 not-for-profit organization provides a shelter, fostering and adoption opportunities and educational programs all centered around animals in need. The veteran took a unique avenue in life to get to where she is today. Allard, who admits she was a high school dropout and later got her GED, enlisted in the U.S. Army at age 27. She moved up the ranks to become an E5. After serving six years in the Army, she transitioned into the Air National Guard where she became an E7 among the Air Force ranks, also working with the greater Joint Communications Support Element and Central Command. She later joined the Department of Veterans Affairs, spending over four total decades working as a federal employee. Allard can say she has two claims to fame within her kin. She is the first female in her family to be in the military and the first to earn a college degree. Despite the delay in officially completing her high school education, she would go on to earn her associate’s in liberal arts from Saint Leo University in 1985 at the university’s education center on MacDill Air Force Base in Tampa. She has nothing but praise to offer for her professors. Being accommodating to the often unpredictable lives of military members was also a huge benefit she truly relished in as a Saint Leo student. She walked away with several key core values and skills that allowed her to be successful both personally and professionally. In March 2000, Allard launched We Care For Paws Foundation after a feline unexpectedly paid her a visit. One thing led to another, and she wound up being responsible for several pets whose owners had passed away. The animals live comfortably in 10’-by10’ kennels, allowing them to move around and dig. Many of them are older, and some are disabled or have been abandoned. “When animal control comes out to take a look at the facility, we always pass their inspections,” she says. Allard has several volunteers who come in to walk, feed and provide water to their favorite animals, including a doctor, a pediatrician, a real estate broker, a maintenance supervisor and college students who travel to her home from all over the state. She also places some of them in foster care from volunteers willing to take them on. 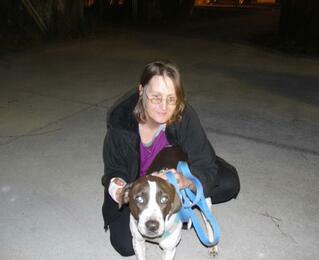 However, she is always looking for volunteers, foster homes and those who can adopt any of the animals. In addition to caring for pets in need, the nonprofit has provided unique educational programs to children in school. This past fall, Hurricane Irma took a toll on Florida and presented a bit of a challenge for Allard and her animals. In 2005, she volunteered for two weeks during the aftermath of Hurricane Katrina in New Orleans by teaming up with another organization out of New York City. She adds that dealing with the people was quite eye-opening. As for the future of proper animal treatment and care, Allard has a positive outlook. We Care For Paws Foundation has a website and a Facebook page with more information about the organization and how you can get involved. Photo credit: The photographs included in this blog post were provided by Carol Allard and are used with permission.